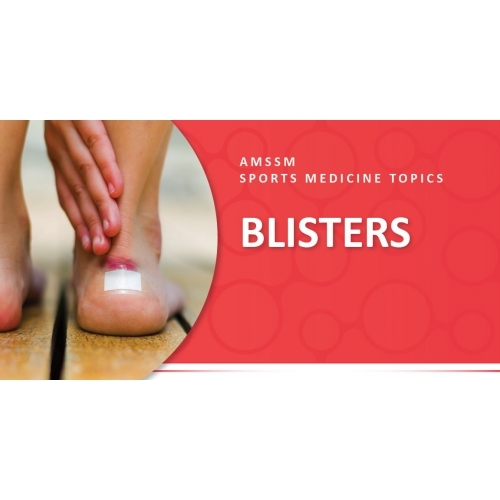 Blisters are fluid-filled swelling formed at the pressure points in feet and hands due to the friction between the foot and shoes/socks or a hand and tools or sporting equipment. They are frequently encountered in hikers, runners, mountain climbers, military trainee and endurance athletes. Most blisters are minor, but they may impair concentration, decrease athletic performance and enjoyment. They may lead to pain and inability to complete the sporting event or withdrawing from the activity. Military trainees with blisters were found to have a higher incidence of overuse injuries of knees and ankles. The first sign of a blister will be redness over the skin at the pressure point. Most of them are filled with clear or cloudy fluids. Blood blisters are formed if the underlying blood vessels are injured. • Preexisting foot abnormalities like hammer toes, bunions, etc. • Debris inside the shoes. • Unusual activities like mountain climbing, running on the irregular surfaces etc. Most blisters will drain and heal themselves naturally. For larger blisters, it may be necessary to pop them in safe manner. It is important to contact a doctor if they are large. Ruptured blisters should be taped to prevent further damage and pain. Several over the counter products are available to help prevent and treat blisters by covering and protecting them from further damage. If there is increasing redness or swelling around the blister, or the patient is having fevers or chills, then a medical evaluation by a physician is needed to determine if there is also an infection present. • Shoes: Poorly fitting shoes that are either too tight or too big will increase rubbing or friction on the foot and toes. Running shoes should last 6 months or 500 miles. • Feet: Keep feet as dry as possible. Change socks regularly. Use foot powder to keep dry. • Taping: protect risk areas with tape dressing. • Socks: some people advocate for double layered socks. 1. Paper Tape Prevents Foot Blisters: A Randomized Prevention Trial Assessing Paper Tape in Endurance Distances II (Pre-TAPED II); Lipman et al; Clinical Journal of Sport Medicine: September 2016 - Volume 26 - Issue 5 - p 362–368. 2. Injury Occurrence and Mood States During a Desert Ultramarathon; Graham, Scott M.; McKinley, Mairi; Chris, Connaboy C. More; Clinical Journal of Sport Medicine: November 2012 - Volume 22 - Issue 6 - p 462–466.